The History of Our Church . . . 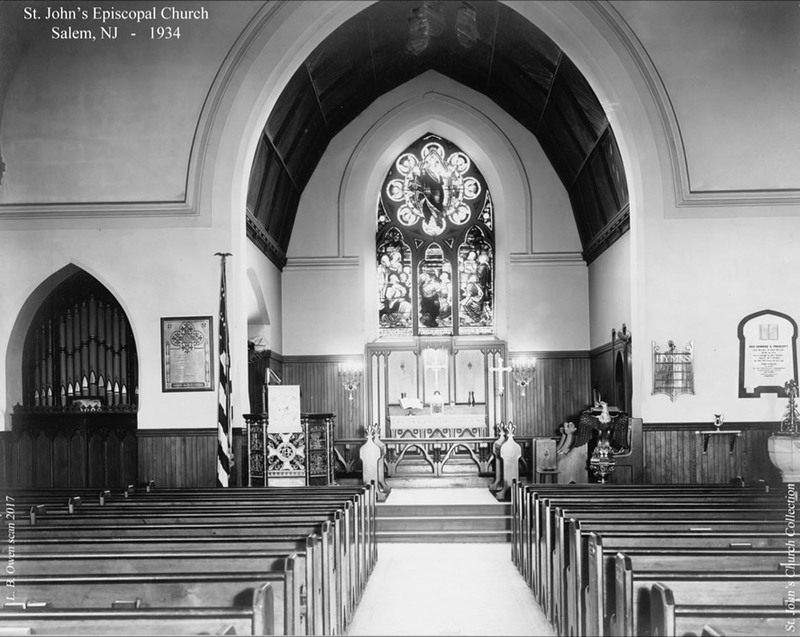 The Episcopal Church in Salem may have had its origins in 1675 with the arrival of John Fenwick, founder of Salem. It is believed that among the predominately Quaker groups who came with him were several members of the Anglican Church. As time passed the number of Anglicans in the colony grew larger, and early in the history of the colony occasional services were led by John Talbot, Rector of Emanual Church in New Castle, Delaware, in the Salem County Court House. There is a record in Minute Book No. 2 of the Court of Salem, New Jersey of a marriage performed “after the manner of the Church of England” on March 23, 1691. By 1702, Talbot visited Salem at regular intervals. In 1722, the tiny group appealed to the Society for the Propagation of the Gospel in London for a minister. In 1724, the Reverend John Holbrook arrived. Until his arrival, two Swedish Lutheran pastors read prayers and preached in Salem. Under Holbrook in 1725, the congregation began the building of its first formal structure. 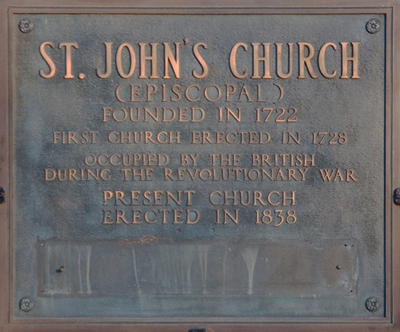 The first service was held in the new building on June 24, 1728, St. John’s Day. After Holbrook resigned, the Society in London appointed the Reverend John Pierson who arrived on January 30, 1734. Until his arrival the congregation had been held together by Peter Tranberg, the Lutheran pastor at St. George’s in Penns Neck. Pierson ministered to St. George’s and Greenwich, as well as to Salem. During the Revolutionary War, the church structure was heavily damaged by the English troops in their raid on the area in 1778, probably because so many members of the congregation were patriots. The English commander, Colonel Charles Mawhood, posted a list of Salem men proscribed as rebels, three-quarters of whom were Episcopalians. The church building suffered from neglect and decay, and the congregation almost became non-existent. After a succession of priests, the parish strengthened. During the Reverend Henry Mason’s tenure as Rector, a decision was made to erect a new house of worship on the site of the old church. William Strickland of Philadelphia was appointed architect. The cornerstone was laid by Bishop Doane in the presence of clergy from Philadelphia and Swedesboro. The building is a blend of Norman and Gothic revival styles and is constructed of “Port Deposit” granite. 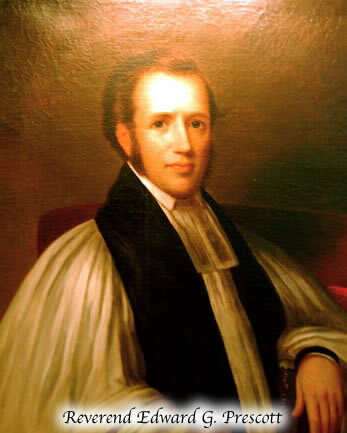 The Reverend Edward G. Prescott, then Rector of St. John’s, delivered the dedication sermon during a ceremony on February 8, 1838. From that time until the present, the history of St. John’s is one of steady growth and improvement. 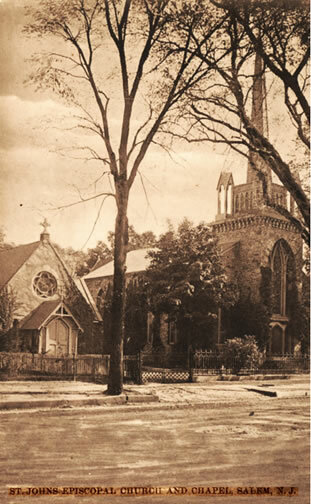 In 1880, the church was enlarged and remodeled by architect George Hewitt of Philadelphia. Hewitt was a partner of Frank Furness, a noted architect of the Victorian period. Hewitt also designed the present chapel building which was built in 1883. During the tenure of the Reverend Thomas V. Wingate, a new Kimball organ was given to the church jointly by George Rumsey and Mrs. Emma Harker Acton. Also added were memorial doors, a tile vestibule, a prayer desk, and a litany prayer desk, and various accoutrements. A trust fund, the income from which went directly to the church, was established under the will of Eugene H. Rumsey, who died in 1944. Under the management of his brother George, the trust had grown substantially and the income from it was the basis for financing a program of renovation and restoration to the interior of the church that was completed in 1956. Five stained-glass windows were given in memory of the George A. Rumsey family. In 1959, under the tenure of Reverend Fred B. Schultz, the property adjacent to the churchyard was purchased by the church to make room for the present Parish House. The pipe organ was enlarged in 1967. The impeccable manner in which St. John’s maintains its buildings and grounds is a continuing asset to the National Historic District in which it is located. Interior of St. John's, ca. 1934. Façade of 1868 Hall-Labagh pipe organ can be seen on the left, which was used until the 1937 installation of the Kimball organ. 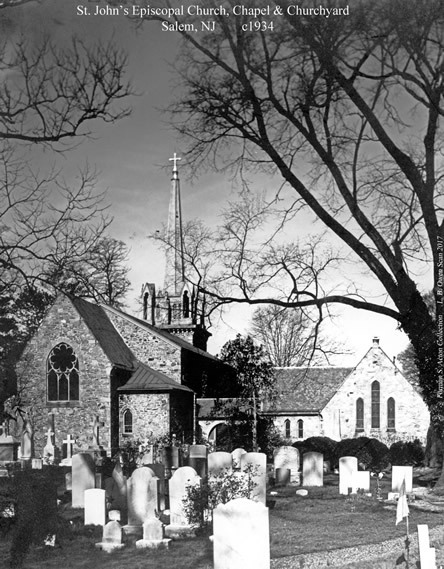 1934 photo of the exterior and cemetery. 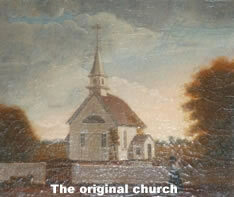 Note the original 1838 wooden steeple and bell tower. Both above photos with more comprehensive captions appeared in recent issues of the Forerunner.